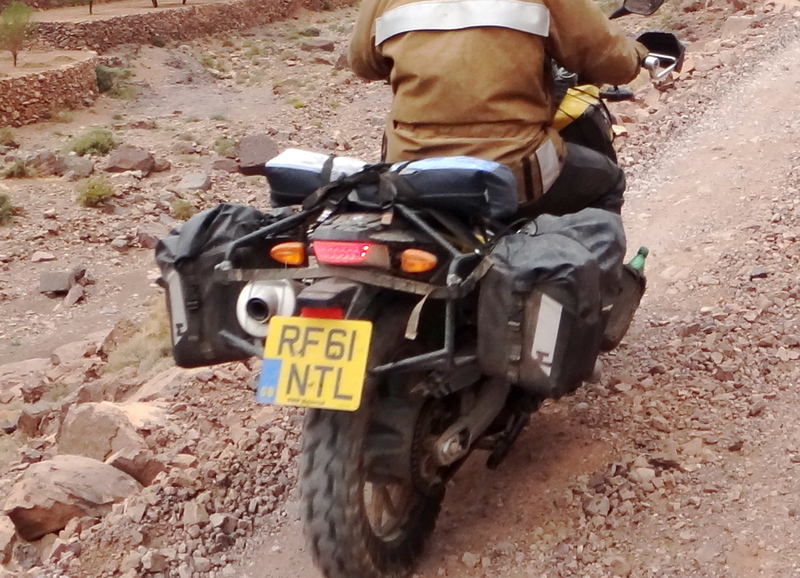 Thirty-litre, Cordura and TPU-coated fabric, roll-top, throwover panniers. Spain and Morocco in March 2012 on a BMW F650GS SE. to update my Morocco book. The bags were used with a kit bag of camping stuff across the back seat but that got stolen early on so most of the time I just had the Monsoons along, plus a small tent and bag I got lent. These bags were supplied wth an Isolation Bag and a pair of Rok Straps in exchange for an Enduristan advert in my forthcoming book. According to my measurements the Monsoons are 33 tall x 25 wide x 36cm long so do have a genuine maximum capacity of about 30 litres as claimed which makes them a very useful four litres bigger than the Ortlieb Saddle Bags, their main throwover competitor in Europe at a stated 33 x 21 x 38cm or 26 litres. Australian Steel Pony Gascoyne’s are listed as 37 x 23 x 44 = 37 litres plus the nifty outer bottle holders. Andy Strapz Expedition Panniers say they are 30 x 18 x 33cm which comes out at 18 litres plus the outer mesh pocket, though they claim up to 25 litres volume. I used a pair once in the desert and don’t recall them being anywhere near 25 litres when rolled up, but that was several years ago. Since I wrote this Adv Spec Magadans are around at 32 + 3 with the pockets. 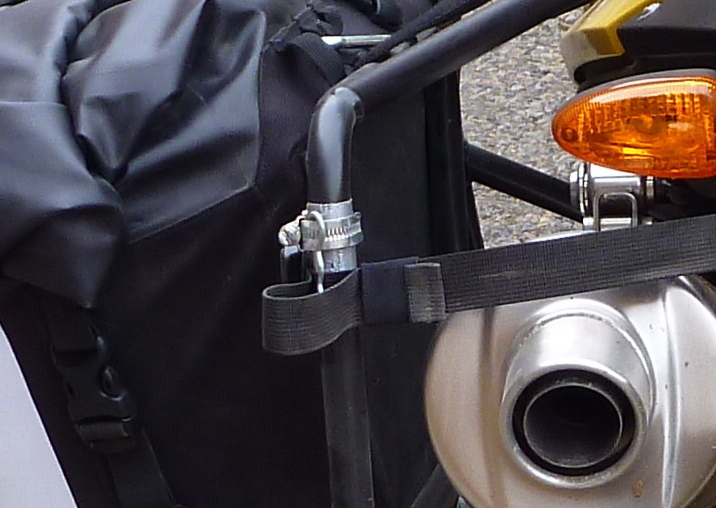 The Monsoons throw over and adjust with two-inch wide velcro straps, and to stop them moving forward or back an elasticated strap at the front lower edge attaches to a pillion footrest mount, while another non-elasticated adjustable strap runs across the back from the top of each corner to limit forward movement which studies have shown to actually be the greater dynamic load when riding. The outer bags are made of an unproofed 1000D Cordura lower which is sewn to a thermally coated polyurethane (TPU) fabric upper for the rolling section which is welded to itself to make a cylinder. The top edge of the outer is then partly sewn to the inner, red TPU coated, thin nylon-like fabric lining (left). 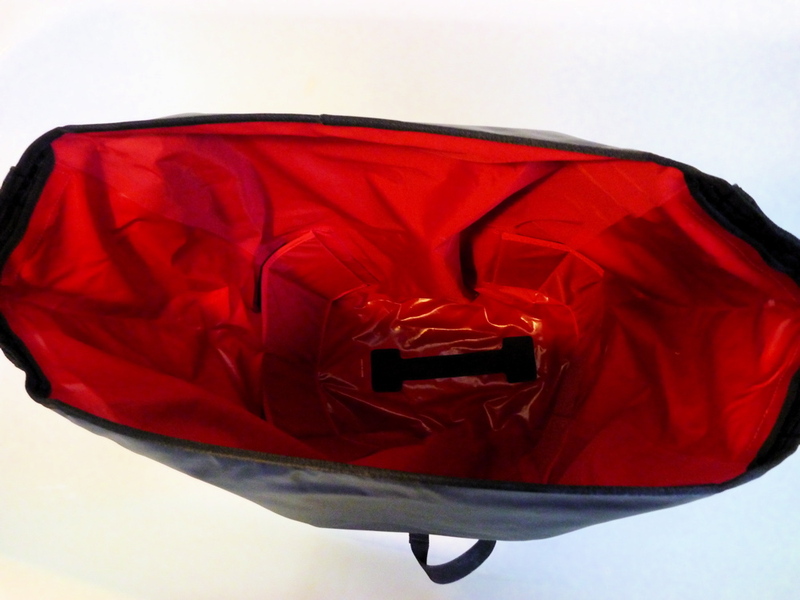 This waterproof red liner is also RF welded into a bag shape which I feel is better than stitching, and then taping. Separating outer abrasion from inner waterproofing differs from say Ortlieb Saddle Bags where the bag is made of thicker waterproof vinyl that is probably less resistant to abrasion than Cordura. In between the Monsoon’s inner and outer layers you slip in a flexible plastic panel (not pictured) which fixes into position neatly with velcro tabs to give the bag its boxy shape. Enduristan claim that this panel gives a ‘third’ layer of protection from flung up debris which I suppose is true, but let’s face it, it’s really a shaping panel, like the Zegas had in box form. What’s more important is the front outer corner of any pannier which takes the brunt in a fall, and this vulnerable area was not reinforced. 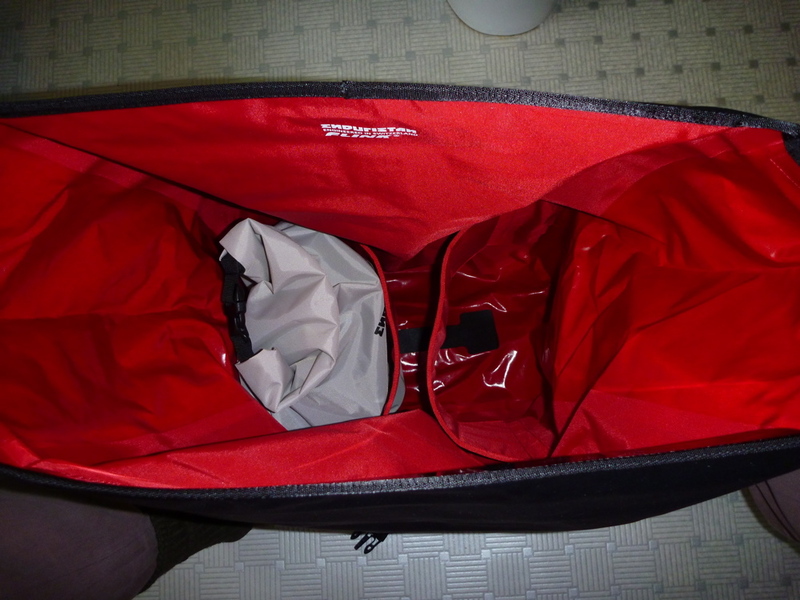 The waterproof red lining had a pair of clever, flip-out dividers to make optional compartments in the lower half and into which slips the 7.5-litre Isolation Bag accessory (right). Unused, these dividers take up virtually no space. There are no actual pockets inside on the red lining though up to a point you can slip stuff between the lining and the outer – a hidden compartment of sorts, but it won’t be within the waterproof inner. No pockets on the outside either, but plenty of attachment loops (left) for mounting stuff over the top. That’s not so convenient for easy bag access; I’d have prefered attachment points on the front/back panels as well, but the clip down points for the roll-top get in the way which is why Steel Ponys roll tops clip as they do. First up I must admit that while I like soft baggage, throwovers are not my preference for the age-old reasons. But although I had three offers of hard luggage for my Morocco guidebook updating trip, I was keen to compare these new Monsoons to the well established and recently redesigned Ortlieb Saddle Bags. Perhaps unusually, I used these bags over a Metal Mule rack. Had I not had this rack the bags would have swung around much more and probably got stressed or damaged on the wheel/swingarm. Or, to limit that would have had to be mounted awkwardly high. (Since writing this review Enduristan have told me that they testing a rack adapting kit for Monsoons). It’s notable that Andy Strapz now suggests that his bags mount much more securely on a light rack (which he can also sell you). He’s right; a pair of Andy Strapz panniers I lent someone melted in a short run on the back of an XR650L one time, though that would have happened to any throwover, as many, many of us have found over the years. With its wide, sub-seat fuel tank the F650GS may not have been an ideal candidate for Enduristan throwovers; it just doesn’t have the nice flat sides to suit them. Even then, I mounted the bags as low and as far forward as possible to centralise the weight and was typically running up to 10kg in each bag. Even in that position they never got in the way when I was paddling the bike hard through soft sand. Pushing the bike through even softer conditions was made awkward by the width of course, but better that than an alloy pannier’s hard edge. 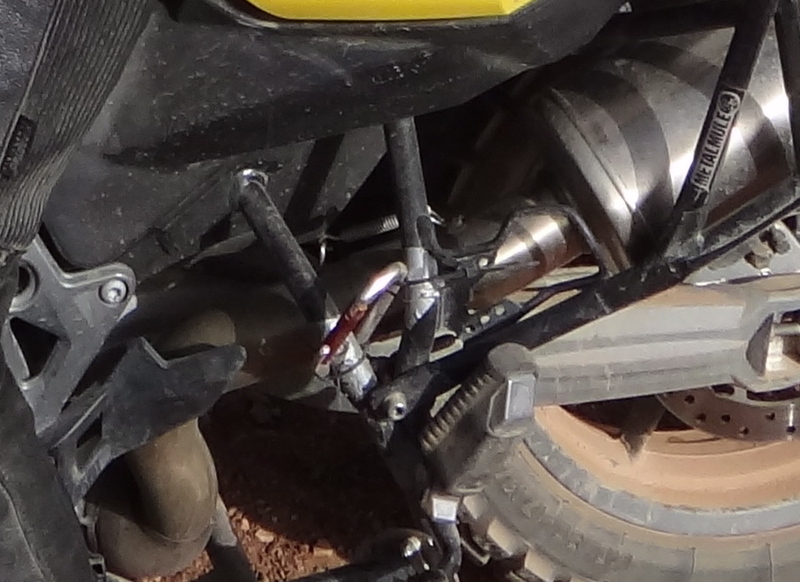 It never crossed my mind that the Monsoons might hurt me as it often did on Desert Riders with ally Touratech Zegas. At 30 litres I’d say they’re still a bit small. The fact is there’ll be times on the road when you want 40 litres and other days when 20 will do. I prefer bigger bags low down and as far forward as possible on the sides, then something small over the back seat/rack – a bag or even a small lockable box. At least with roll tops you have the capacity to deal with varying volume needs, although to me the shape is not optimal – too wide. I’d have preferred a longer, slimmer profile, though it seems most soft panniers use width or height to gain volume, keeping the front-to-back length short presumably so as not to interfere with passenger legs, where present. My first problem was finding that the velcro straps were way too short (right) to fit the F650, and would have been barely long enough even without a rack. I extended them by making two loops of two-inch strap I had lying around and adding some mini carabiners as buckles; that worked fine. 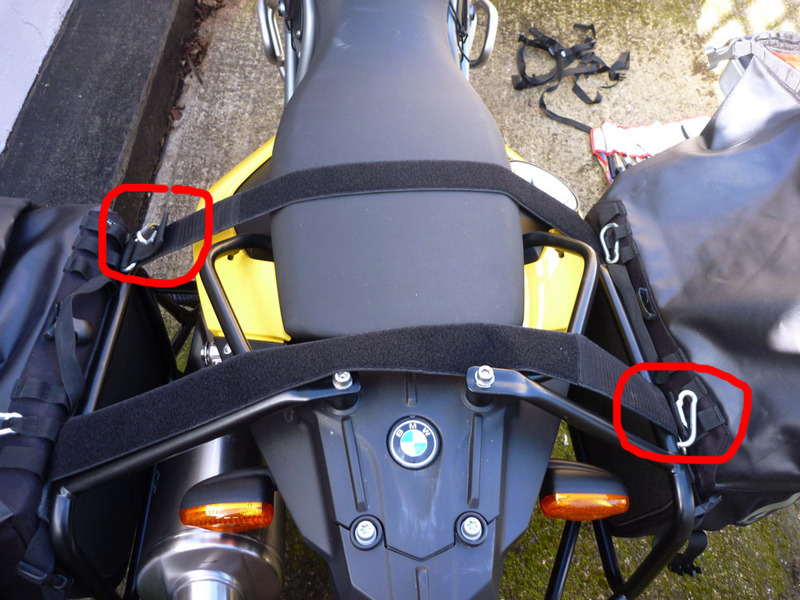 On the GS the forward pillion footrest straps lined up just right, but on the exhaust side would have been way too close to the pipe, so I clipped and zip-tied a carabiner in there (left) to move the strap point further away. The back strap also wouldn’t have worked on my bike as it was set up had I not fixed on some R-clips with jubilee clamps on the back of the rack to keep the strap in position (right). That was a temporary fix which may have eventually worn through the strap. Had it been my bike I’d have come up with a better long-term solution. 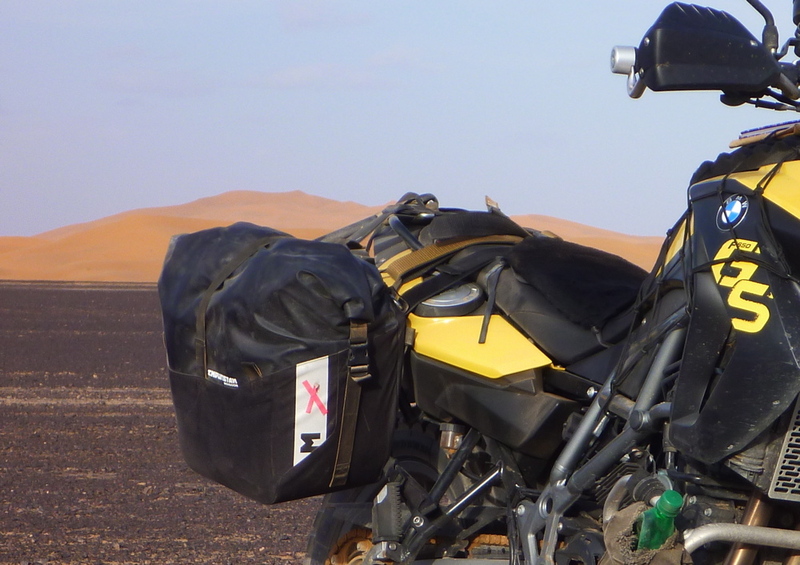 Once I did all that I have to say the bags never shifted in all the rough riding I did in Morocco or <80mph riding on the way back, although on the dirt I did use an extra belt between each bag’s handles (left) as I wasn’t convinced the velcro would hold. I’ve taken the same precaution on many other panniers I’ve used over the years. I complain about them being too wide on the GS (right), but it’s just occured to me that the stiffening plate you insert to give the bags form could easily be trimmed or even removed altogether to make a more saggy but less wide profile. I wish I’d thought of that in Morocco. As it is, my bags picked up passing thorns as well as tears and scuffs off passing rock faces and were a nuisance on narrow mountain tracks where I was forced onto lines I’d have preferred to avoid. They are I suppose no wider than a hard-cased GS1200, and at least a soft bag deflects you less when you bump into something hard, and hurts less when you bump into someone soft or have the bike fall on you, all of which is reassuring and the reason we go soft, is it not? At the end of the day the bags clipped off easily and could be heaved over a shoulder to walk into a hotel, hands free. Ortlieb QL2 Side Bags (31 x 18 x 43cm – 28L) would have clipped off a rack effortlessly. I’ve used smaller Ortlieb QLs on pushbike tours in the Himalaya and I can tell you when you’re shagged out it’s so nice to just lift the bag off the rack with the handle and then slot it on again next morning; no grubbing about with straps. Had it been a wet and muddy you’d get all mucky undoing the Monsoons, but that’s the way it is with all soft bags on motorbikes. 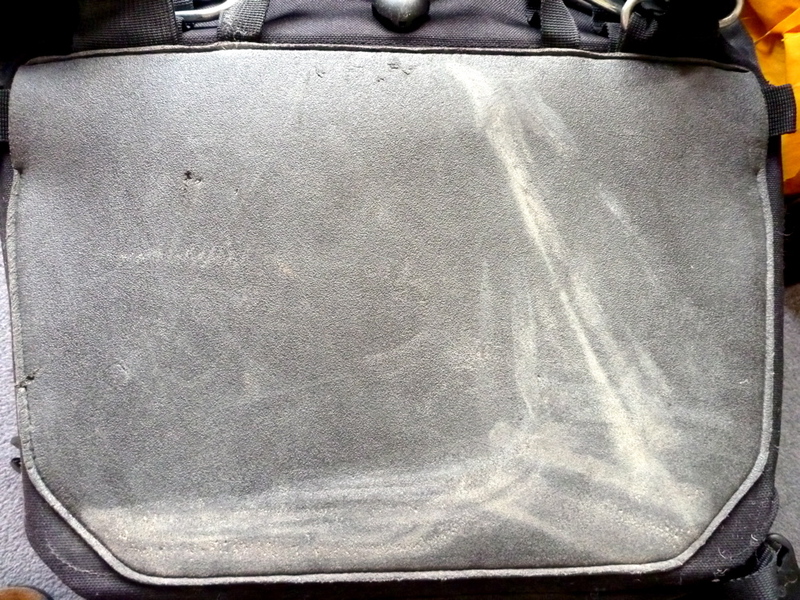 Eventually the bags got quite grubby and dusty, but so was the bike – hosing it all down at a car wash fixed that. 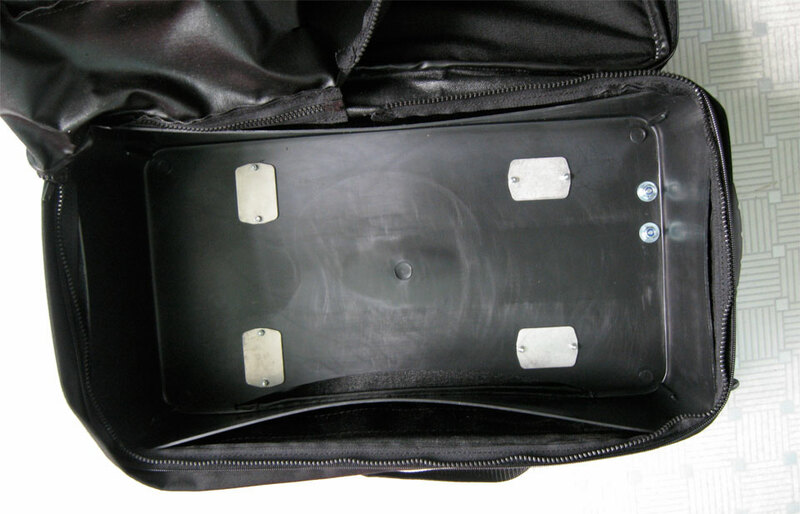 The back panel – a sort of dense closed-cell foam (left) – stood up pretty well to being rubbed on the rack for weeks. But the outer face of the left pannier (right) which stuck out more because of the pipe, had a harder time of it, even though I was trying to be careful and never consciously felt myself barge into the scenery. The only chance I got to really test the Monsoon’s waterproofness was on an 800km-day back across Spain through several showers and one mega downpour with flooded roads with run-off. Even though I’d been expecting this and cinched the bags up nice and tight, when I got to the hotel that night there was some wetness inside the red liner along each forward end of the roll top where it clips down to the front panel of the bag. I’m not too surprised by this; roll top closures can’t really claim to have a waterproof seal, for that you need something like submersible Watershed Dry Bags (my 30-litre Watershed with new tent, bag and mat was among the stuff that got pinched off the ferry). Water being what it is, by pelting a roll top bag at 70mph capillary action will eventually see it seep through to the insides. 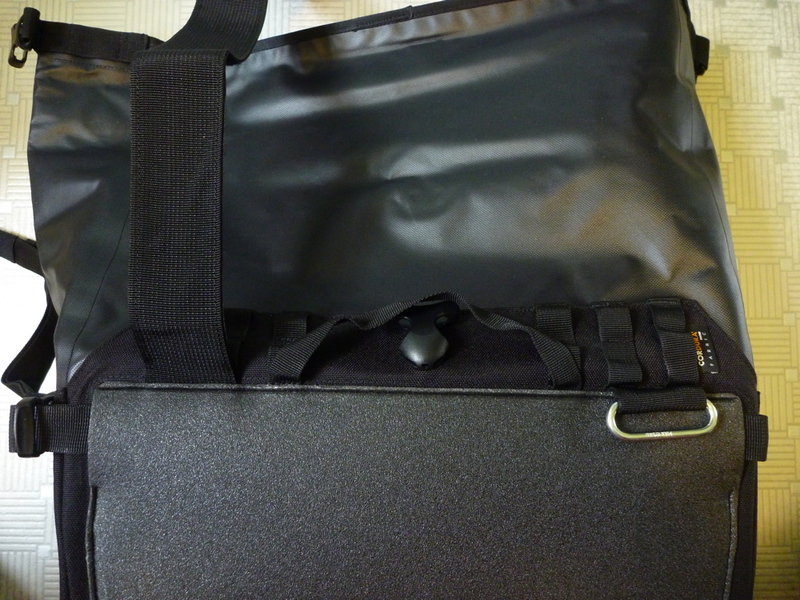 The top outer panel of the bag has a lightly textured exterior surface (uncoated side of a fabric?) which I believe may exacerbate this. A smoother surface to roll up (like thick PVC SealLine Baja bags) might help reduce ingress. It also occurred to me that the flat, flexible plastic, inch-wide stiffening ‘blade’ that’s sewn along the top edge to give you something to roll against might be better off being a piece of flexible tube or hose. That would be much easier to roll up tightly and without creases to stem the ingress of water. So, all up I’m a bit lukewarm about the Monsoons even though nothing broke or failed in three weeks hard use. The initial strap shortage was annoying, the width was also annoying and was made only a couple of inches so by the rack. I believe for actual overlanding rather than weekend camping, a soft pannier is much better off resting securely against a rack, or better still sitting on a platform rack (more about that later). Enduristan can’t be blamed for making a boxy shape like Ortlieb, but I’d much prefer a longer, thinner shape like the Steel Pony Gascoyne (seen but not tried), or a ‘suitcase’ shape (more about that later, too). I also think the fabrics are a bit thin to survive a tough, trans-continental trip – that is the perspective taken and intended use for all gear reviews on this ‘website of the book’. 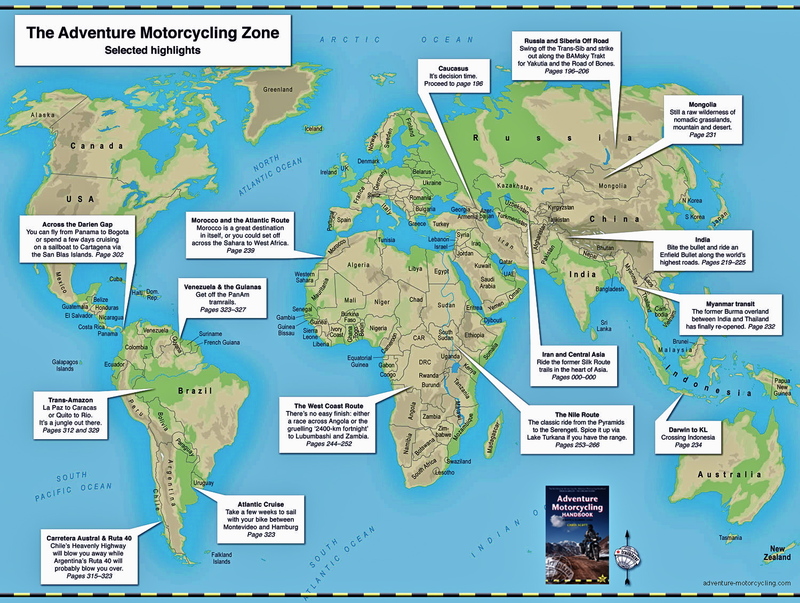 I never fell off the GS or had it fall over but that, as well as rough use, is all part of motorcycling across the wilds of Africa, Asia and Latin America. The Morocco ride gave a good snapshot of that and if I was doing a longer trip with Monsoons I’d consider sewing on a second layer of material to protect the base and the damage-prone leading outer corner from wear and road slides. The fact that the Monsoon’s Cordura lower is not waterproof makes sewing onto it no problem. (it doesn’t claim to waterproof; the base filled up as it seeped through when I washed them in the bath back home). Pockets could also be added here now I think about it. But making the bags slimmer as I suggested earlier by trimming/removing the flexible panel may not be that effective as the bags are cut to fit that panel. Zip-free, roll top is definitely the way to go, but what we want are big side bags mounting low down but without pedestrian-menacing width. 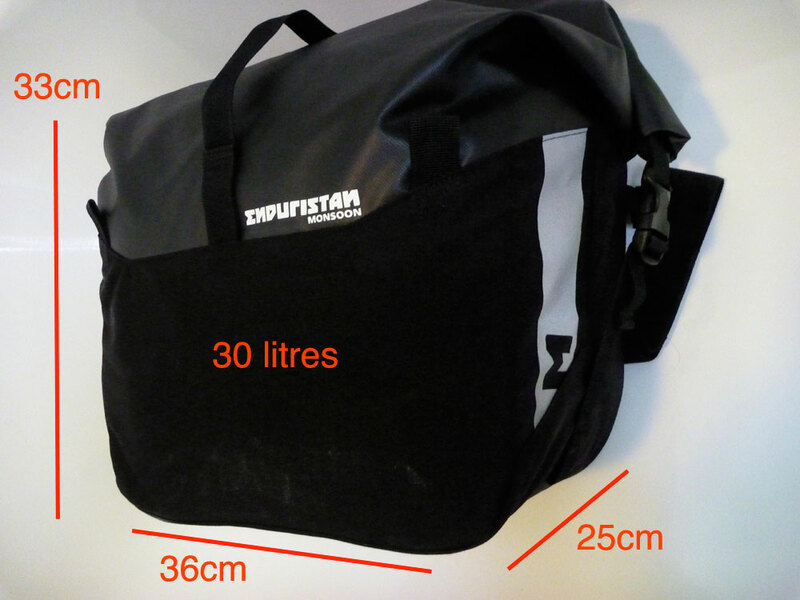 I’d like to see Enduristan or anyone make a full-on, rack-mounting or rack-resting expedition pannier at 35 litres slim and in OTT tough abrasion-resistant fabric and similarly tough vinyl inner liners; separating the two is a good way of doing it because for resistance to rain and abrasion you need something like hypalon raft fabric (more about that another time). Since I wrote this Adventure Spec Magadans have come on the scene and answer many of my above requirements. This entry was posted in Adventure Motorcycling Gear Reviews, AMH News, BMW F650GS SE long term test, Luggage and tagged adventure spec magadan bag, Andy Strapz Expedition Panniers, Enduristan Monsoon review, kriega overlander system, motorcycle baggage, motorcycle luggage, Ortlieb Saddle Bags, Ortlieb Side Bags, SealLine baja bags, Steel Pony Gascoyne, Watershed Dry Bags.. Bookmark the permalink. PS. There’s always the thorny problem with soft luggage of the exhaust. I know you could drop your throw-overs on a bike already fitted with luggage racks as you’ve done but to me that seems a compromise, why weight the bike down with racks designed for aluminium cans? SW Motech seem to have found an elegant solution with their Quick-Lock system. They use a simple support bar, seen here which their bag slides onto, before the straps are put over the saddle. Just a pity the bags that go with them are far more suited to road than off-road. Good idea those bars – not seen that before. That is all that’s needed to keep a bag out of the wheel on the road, and I suppose they could be used with any throw over. But when you crash or even just fall over that bar will surely fold in or at least bend a bit. One advantage of racks is that they can potentially strengthen unsupported rear sub-frames, making a load-spreading cuboid structure out of a cantilevered beam – something which has benefits whether your baggage is soft or hard. Thanks for the review, I had been considering these but have decided against as for serious travels they don’t as you mention seem up to it and for weekends away I’ve rather save £140, and go for the Cameron Barker roll tops at £65. I see Kriega are making just the type of thing you mentioned, but with two of their 30 litre bags per side. Looked good at the MCN Excel. I was also chatting to the people at Overboard, who do waterproof bags and cycle panniers and are looking at the motorbike market. I’ll send them your review so they can pick up ideas. Hi Mark, I’ve not heard of Cameron Barker but see how they would do the job for weekending. 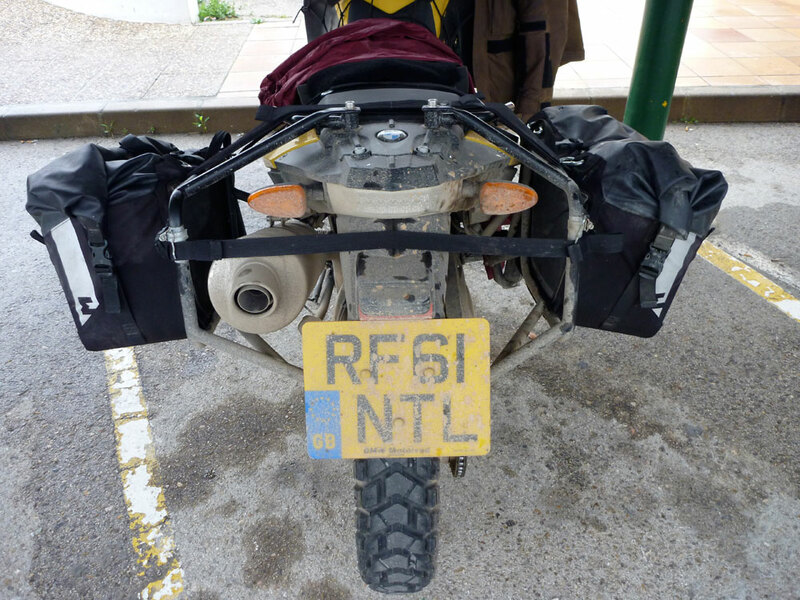 I also had a close look at the Kriega Overlanders at Excel and have been on at them for years to make some AM panniers up to their high standards. I’m not sure why they went for 2 small bags which strap onto a plate which clamps to a rack. Dom explained it as better organisation/separation but that’s something better done inside one big bag. I suppose the modularity may be appealing in the US where journeys are shorter and those strap-on fuel/water plastic cans are popular. I’d sooner use bags for that. Perhaps two 15L bags make less individual strain? Also, I thought the use of four Q/D cycle ‘skewers’ to clamp the plate to rack looked a bit fiddly when demonstrated to me. You have to lift the lever and unscrew all four of them. I know we’re only talking about seconds, but a quick and foolproof mounting is important when you’re dozey/distracted in the mornings or knackered in the evening. There must be a simpler way to get around Ortlieb’s QL2 patents, if that is the problem. As I said, on a pushbike that system was effortless and stood up to two 1000-km rides on rough roads. As it happens I’ve name checked Over-Board in the new AMH as a cheaper source to Ortliebs for roll-top duffels. 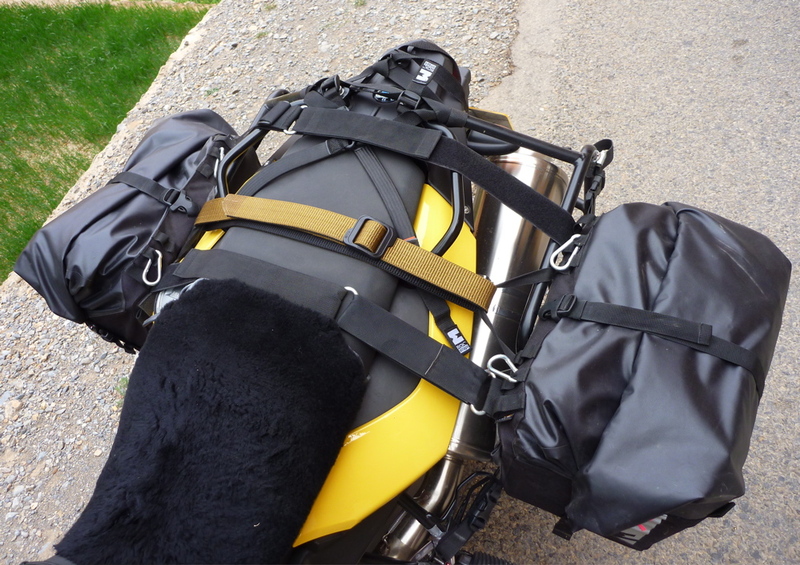 I see there’s a lot of good stuff on there: the OB1026B could be a good pannier liner and the 30-litre OB1047C or cheaper OB1054B backpack could be the basis of a pannier itself. Much depends on how that material copes with sliding down the road under the weight of a moto. I too wondered about Kriega’s system. I could see the point of the two bags per side if they quickly and individually detached so that you could leave say your tools and spares on the bike whilst taking off the bag with your clothes and camping gear to take inside your tent, but you have to take the whole plate off which seems to defeat the point. I suppose it does mean you could ditch the plates and just use a single bag as a tail-pack? Also those quick releases are hardly that secure although could be replaced with Quik-lock system skewers, which have a removable lever. Quite how tough Overboard’s bags would be when sliding down the road I can’t say, but they seem tougher than Ortlieb’s equivalent. 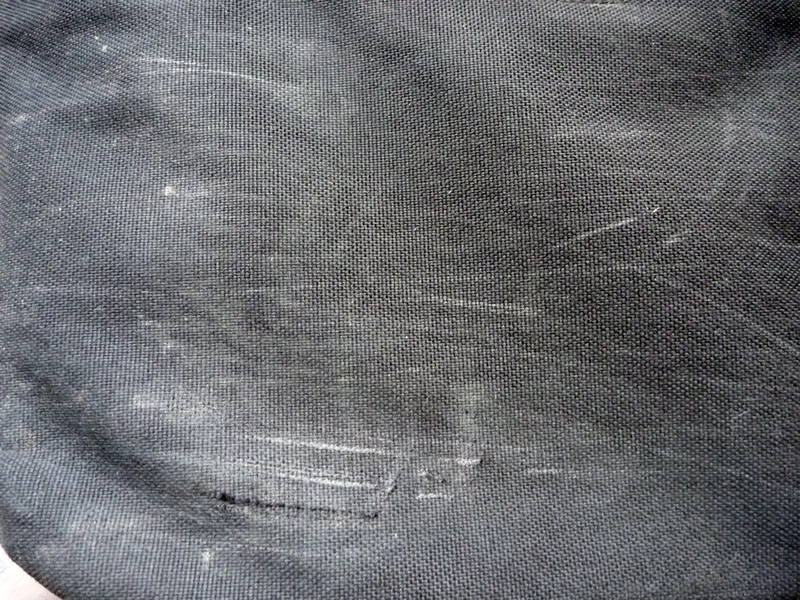 The huge roll bag I had strapped on my pillion certainly copied with being dropped on, and the air trapped inside served as a nice cushion keeping the bike off the ground. I hope they can be persuaded to consider the motorcycling market, as indeed Lomo, who also make dry bags which could be tweaked and are even cheaper than Overboard.